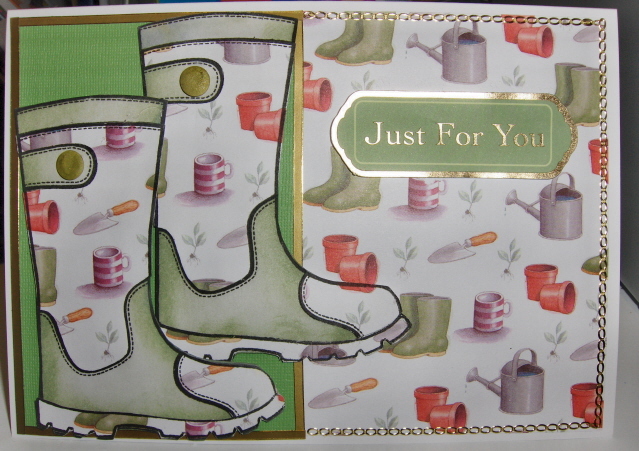 A couple of weeks ago you may remember, I purchased a Wellington Boot clear stamp by Woodware, (from Bee Crafty in Bidford upon Avon) and went crazy making lots of wellington boots. 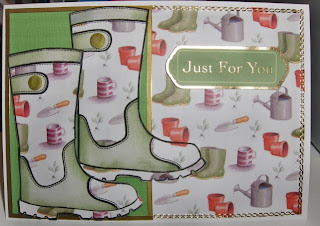 Up until today I did not know what I was going to do with my collection of boots, but whilst sorting through my hand crafted greetings cards I came across a card that I wasn't really happy with. So I took it apart and reworked it using two of my wellies that just happened to feature the same paper. (The paper was from a Forever Friends 6 x 6 paper pack called "Just For Him") I must admit I am quite pleased with the result. So much so it has inspired me to use the other boots I have made. So as usual watch this space!